There was also a Major Storm for parts of Northwest MS and Memphis before Christmas that year. I believe I found a report a couple days ago that stated there was still 10 inches of snow on the ground for Memphis, Christmas Day. Cold Rain grandfather, already had the RAH snowshield built! 87 still has to be the most painful winter for RDU. 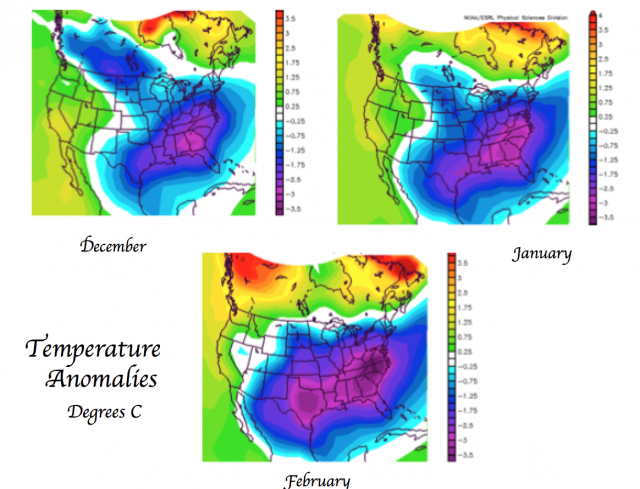 Missing back to back mid-Jan winter storms by 20-30 miles. Feb made up for it but still missing 10-15 of snow by that close. Yeah this is what I was getting at a few weeks ago, don't get me wrong 86-87 was still a great winter, but that's a common theme you see throughout many (certainly not all) El Nino winters in the historical record. The chances that the Triad cashes in more than RDU (relative to the average of 2-3" or so) is higher than normal during El Nino. Wow, I would love a couple of weeks like that again. Check out Bastardi’s daily video on the weatherbell home page. Only do it if you like good winter things. Had to shower after watching it. Definitely a good video to watch. I'll post the direct link when they upload it to facebook. More recently I remember 2009/10 was painful for RDU, still a good winter on the average, but witnessed storm after storm from December on nailing Roxboro and places North repeatedly. Yes, Memphis received 14" of snow on December 23,1963 and also recorded a record low of -13 on December 24, 1963. 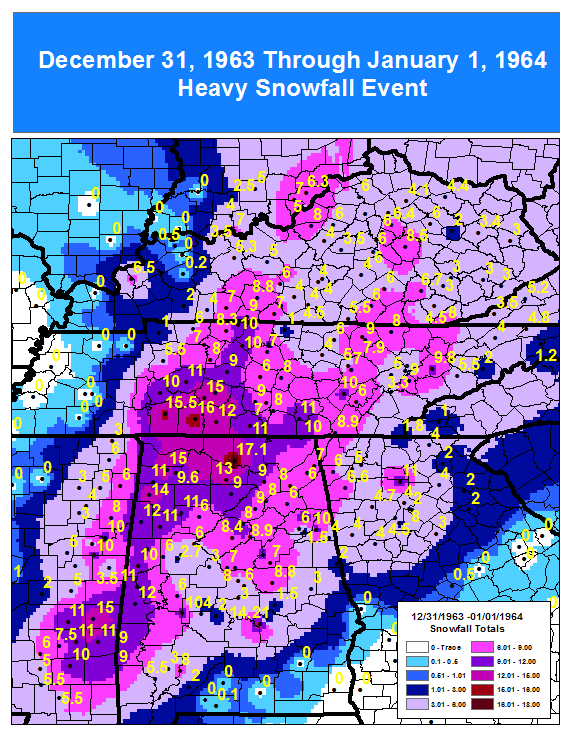 This was the 1st of two Winter storms that month; the next one was further South-East covering Alabama and Middle Tennessee. Here is a video of the December 23, 1963 snow in Memphis. And southeast of us too. Yeah, there's always a lot of talk about 09-10 but I don't remember it being that great for CLT either. I think we had 2-3 events but they were pretty minor, nickel and dimes. February 26-27 2004 was my jam. Looks more like a general idea of temperature differences that should be reduced in severity. It's only existed a few years right? Any other years we can compare? AKA, weenie analog model. Going to go ahead and not expect that 500 pattern either. I wouldn’t say busting 1.5-2C widespread for the entire US is a general idea, but I guess it could have busted extremely warm or something so I get it. It is new. I think there’s a couple more years you could compare (at least one more)...the problem is obvious. The big red blob under Greenland that never happened in reality. The “pioneer model” has a bunch of years with a -NAO that never happened. That’s like saying a thief like open doors. To hell with the pioneer, what do the French and German models show ??? models for everyone !!!!! Looks like the pioneer model has some algorithms from the DGEX! I really want to see where we are in reality around Thanksgiving and what the models are spitting out for early December. The ridging across the north Pacific into Alaska and the arctic circle along with the Scandinavian ridge has me intrigued. Why shower, when you can slosh in the tub?